Thoughts on business, entrepreneurship, and life from a Silicon Valley entrepreneur and writer. Ta-Nehisi Coates' cover essay for The Atlantic, "The First White President," explores the role of race and racism in Donald Trump's election as President of the United States. Coates' essay, has been widely read, and drawn praise and criticism (a sign of success; the goal of nearly every writer is to elicit a reaction from readers). My personal summary of its main argument is that the attempts to explain Trump's victory as the result of economic dislocation among the so-called "white working class" are glossing over the impact of race and racism, specifically white racism against African-Americans. "The triumph of Trump’s campaign of bigotry presented the problematic spectacle of an American president succeeding at best in spite of his racism and possibly because of it. Trump moved racism from the euphemistic and plausibly deniable to the overt and freely claimed. This presented the country’s thinking class with a dilemma. Hillary Clinton simply could not be correct when she asserted that a large group of Americans was endorsing a candidate because of bigotry. The implications—that systemic bigotry is still central to our politics; that the country is susceptible to such bigotry; that the salt-of-the-earth Americans whom we lionize in our culture and politics are not so different from those same Americans who grin back at us in lynching photos; that Calhoun’s aim of a pan-Caucasian embrace between workers and capitalists still endures—were just too dark. Leftists would have to cope with the failure, yet again, of class unity in the face of racism. Incorporating all of this into an analysis of America and the path forward proved too much to ask. Instead, the response has largely been an argument aimed at emotion—the summoning of the white working class, emblem of America’s hardscrabble roots, inheritor of its pioneer spirit, as a shield against the horrific and empirical evidence of trenchant bigotry." Rather than deal with the bigotry, liberals have focused on the ability of economic policy to win over the "white working class"
Some of the most powerful arguments in the essay point out the underlying bias in how issues are perceived in this country. For example, why would an opioid crisis call for compassion, while a crack crisis calls for harsher prison sentences? Why are we outraged that life expectancy has declined for less-educated whites, but accept that African-Americans still have lower life expectancies? While I agree with Coates on his second point, I'm not going to examine it deeply in this post. If the arguments in the paragraph above don't cause you to consider the impact of systemic bigotry, my writing more isn't likely to either. Demonstrating to those who believe otherwise that systemic racism affects minorities in this country is a challenge I don't want to take up right now. I will note from my personal experience that even Asian-Americans, the so-called model minority, face racial discrimination on a regular basis. Being Asian is not the same thing as being white, regardless of how well Asian-Americans have done economically in this country. Instead, I'm going to focus on the first and third points. I would argue that despite the fact that Donald Trump appears to be a racist that favors white superiority, that this is not the primary factor that led to his election. I would agree that economics alone do not explain white voting patterns, but I don't believe that convincing racists not to be racist is the optimal path to changing those voting patterns. In his piece, Coates cites a series of statistics that illustrate that Trump won the white vote across many different demographics. The implication is that Trump rode a wave of white racial resentment, catalyzed by Obama's presidency, into the White House. But what he doesn't do is to compare Trump's performance to his GOP predecessors. It's always dangerous to argue from a single data point, because you ignore the context. First, consider the 2008, 2012, and 2016 elections. Contrary to Coates' hypothesis, Donald Trump did not win a significantly higher proportion of the white vote than John McCain or Mitt Romney. In fact, proportionally more whites voted for Romney. In terms of percentages, Romney outperformed Trump across the board, with only two notable exceptions: Trump did better than Romney with men, and with African-American voters (!). My guess is that this can be explained by the fact that Trump was running against a white woman, rather than a black man. Nothing about Donald Trump's performance appears anomalous in comparison to traditional GOP candidates like McCain and Romney. His weakness among women, African-Americans, Hispanics, and the young, are simply the extension of long-term trends for the GOP. 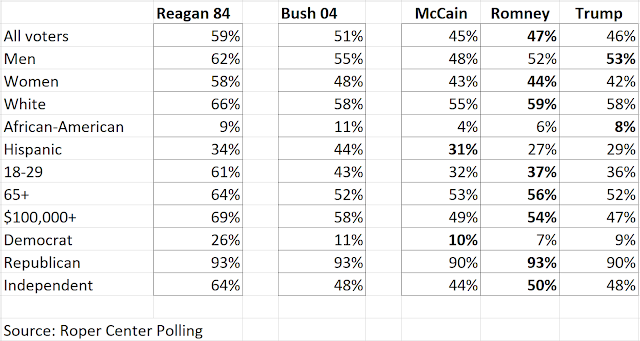 In fact, if we look further back to two GOP electoral triumphs (George W. Bush over John Kerry in 2004 and Ronald Reagan over Walter Mondale in 1984), we can see that while Reagan and Bush did better among African-Americans, the absolute numbers are minuscule. The GOP has always been strongest with men, whites, the wealthy, and the old. But popular GOP candidates like Reagan/84 and Bush/04 were able to perform substantially better with women, minorities, the poor, and the young. It might be that Trump's racism was successful at turning out some white voters, but a) whites made up 70% of the vote in 2016, 2% less than in 2012, and b) he still attracted a smaller share of white voters than Romney's more traditional campaign. Remember, Trump did more poorly than Romney with nearly every group other than men and African-Americans. It seems far more likely to me that Trump's victory was due to his remarkable luck in running against Hillary Clinton, one of the few public figures in American more disliked than he. Clinton combined unpopularity with a complacent and incompetently run campaign which devoted resources to trying to flip "Red" states rather than simply winning Michigan, Wisconsin, and Pennsylvania, and thus the election. While Trump probably benefited from racism, it does not appear that he benefited any more than traditional GOP candidates like Mitt Romney, who didn't go around making racist statements. In many ways, the lack of difference in Trump's poll results makes Coates' point about systemic bigotry even more relevant. The real revelation of Trump's campaign is not that white men tend to vote Republican; it's that you can openly espouse racist and sexist beliefs, mock the disabled, lie constantly, and still win pretty much the same share of those voters. So interesting. I appreciate your unpacking of this data. I admit I remain bewildered by him, but this helps me to understand. I agree with your assertion that his opponent and her unique position in the minds of voters (and, I'd argue, her gender) helped him to this historic win. Given that Trump improved on Romney's showing with only two groups, men and African-Americans, I think it's highly probable that Hillary won fewer votes that Barack Obama in those categories precisely because she was not black or male. The interesting question is why Hillary's improved showing among women didn't outweigh these factors. Part of this is the structural advantage that the Electoral College currently gives to the GOP. Do you know if comparatively more younger people voted when Reagan ran? I'm wondering if the steep decrease has anything do with less civic engagement over time. Personally, I'm not sure that a decrease in the demo's you mentioned are necessarily a huge deal because Reagan won by a significant margin and I wonder if politics going forward will mostly be a game of inches. On your comment about crack vs opiods, there's truth to the reality that the mindset is different. There are a few substantial differences. Crack is cocaine which is illegal. Opiods mostly are not. Opiods having the original source mostly doctors is different than crack whose original source is someone committing a crime. Also, crack became popular in the '80's and attitudes about recovery have changed dramatically since then (although there's a lot more to be done). An interesting comparison might be to consider how people think about heroin vs. opiods. In 1984, 18-29 year olds made up 23% of the votes. In 2016, they made up 19%, so there was some difference. Interestingly enough, the 2008 and 2012 elections, when one would think that Barack Obama would have attracted more young people to vote, the percentages were 18% and 19%. It's a big relative shift, to go from 11 to 13%, and could swing a close election, but it's not a titanic shift. Ok the percentage is lower I wonder what it is actual numbers. My instinct tells me there were more 18-29 year olds in 1984 than there were in 2016. That's fascinating point about Obama, I would have assumed something different. The analysis further points to elections for now being a game of inches. Four of us had dinner last night and came to the conclusion that the odds are better than 50/50 that Trump gets elected again.